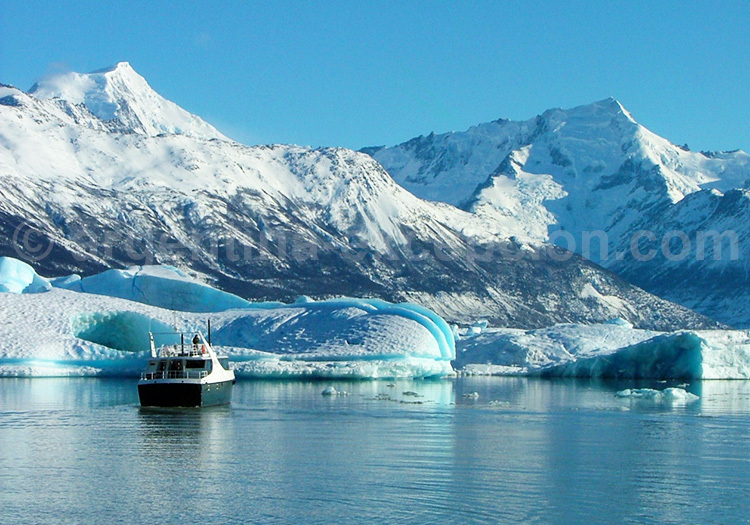 Travel and tour information about El Calafate and El Chaltén. Though Calafate is a small town with nearly 17,000 inhabitants located in the midst of the Patagonian steppe, it has its own international airport… It is located in the province of Santa Cruz, by the Lago Argentino, and it is the direct access to the Los Glaciares National Park, one of the most breathtaking views of Argentina. This place that used to be an isolated town not far ago, along the years has become a premium tourist destination for its hotels, restaurants, transportation, and services. Despite the fast development of the town, its landscape has been quite well preserved. The presidential couple, Néstor and Cristina Kirchner, has chosen it as its summer residency. In summer, maximum temperature averages 17ºC, days are long and the sun sets not earlier than 11 PM. In winter, temperatures decrease below zero (-10ºC – 4ºC) and days shorten offering just eight hours of daylight. We recommend visiting the region between October and April, that is, spring and summer of the Southern Hemisphere. Note that weather is extremely changing in the whole region and the strong winds, occasionally, may prevent departures. See our page: When to go to Argentina. 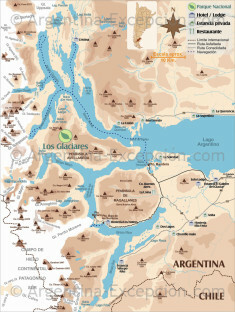 Los Glaciares National Park was created in 1937 and has been declared World Heritage by Unesco. It spreads over 724,000-hectare surface and includes these two glacier lakes: Argentino and Viedma, 47 glaciers, among them: Perito Moreno and Fitz Roy. Part of the huge Patagonian ice cap, the third largest ice cap in the world, between Argentina and Chile, is also protected. In general, visitors are happy enough admiring the glaciers, but with a little more time, you could explore Calafate surroundings to discover the shrub steppe and travel back in time to geological eras. The first stop will be the Balcón del Calafate, which offers a panoramic view of the town, the Patagonian steppe and the Lago Argentino, at 1,000 m over sea level. A very well-preserved pristine environment where only condors stop by. Then, the mineral landscape of the Laberinto de Piedras: rocks carried by the glaciers 85 million years ago. Sculpted by wind and rain, these oddly-shaped rocks seem to have come from the Moon. Piedra de los Sombreros is shaped after Mexican hats having unknown origin. Some of the biggest sheep raising estancias welcome visitors and invite them to take a look at the gaucho life and the times of Patagonia first settlers. The Nibepo Aike estancia, for instance, offers horse-rides down the Lago Roca and the Cordón de los Cristales, or let you check upon the sheep-shearing process. Lago Argentino is the largest lake in Patagonia, covering 1,466 km² surface, and could be up to 500 m deep at some points. It is one of the most beautiful excursions down the region, to be performed by water departing from Punta Bandera, 50 km away from El Calafate. Sailing through drifting icebergs, sculpted by water, and watching the magnificence in them, the shades of blue reflected by the light is, definitely a spectacular experience. 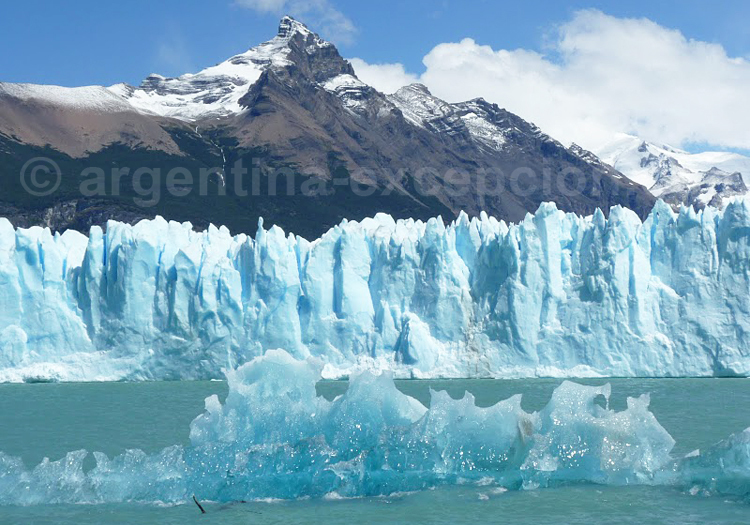 The boat will sail down the various branches to get close to the Spegazzini Glacier, disembark at Bahía Onelli, and approach the Perito Moreno and the Upsala. This excursion takes the full day. Its walls, the highest of all the glaciers, are up to 135 m tall and spread along 1.5 km. The Spegazzini covers 66 km2 and is a huge mass of turquoise ice fed by three small glaciers. On the right, there is a dense surrounding forest, which makes the place much more magical. It has been name after botanic Carlos Luis Spegazzini, the first one to study the flora in the region. The most celebrated and visited glacier. The reason: the fascinating natural view of the continuous advance until the ice hits the land, thus obstructing the flow of the lake’s branch and causing a breakdown due to the pressure of the water. Ice floes come off making a deafening roar and causing a tidal wave. This phenomenon took place the last time in 2006. The wall front is 5 km long and 60 m tall, with a surface of 195 km2, the same as Buenos Aires. Gangways have been opened to get a closer look at the Perito Moreno. Equipped with spikes, you may also walk over, explore, and even touch this huge wonder. Francisco Pascasio Moreno was a great Argentine scientist and explorer who has inherited his name to the glacier and a national park north the province of Santa Cruz. He himself has also baptized the Lago Argentino. This is the biggest of all the glaciers; a giant: it is 50 km long, and has two front walls that extend along 4 km (only accessible through the west front by boat), 70 m tall and has 870 km2 of surface. Ice blocks permanently break down from the wall thus forming icebergs of unthinkable shapes that float adrift. The Upsala is one of the most important glaciers in the park that can also be visited on foot while taking some of the trekking adventures planned there. A plane has managed to land on its plain section surface and the armed forces based on Antarctica train to do that. The glacier has been named after the Swedish Uppsala University which has undertaken the first glaciological research on the region. 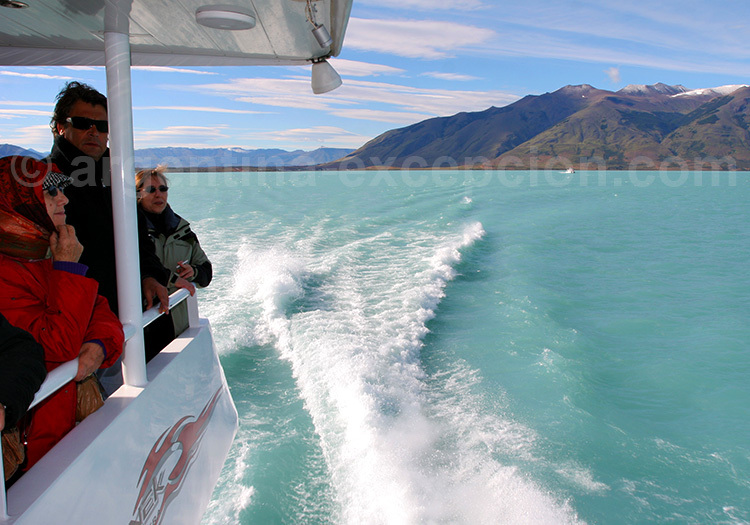 Boats excursions on the Lago Argentino usually stop at Bahía Onelli, where you may disembark. A 800 m pathway through the lenga, ñires (Nothofagus antarctica), and cypresses forest ending on the shores of the bay surrounded by mountains, wherefrom you may watch the Onelli, Agassiz and Bolado glaciers. If the weather is good, it is an ideal place for a picnic. 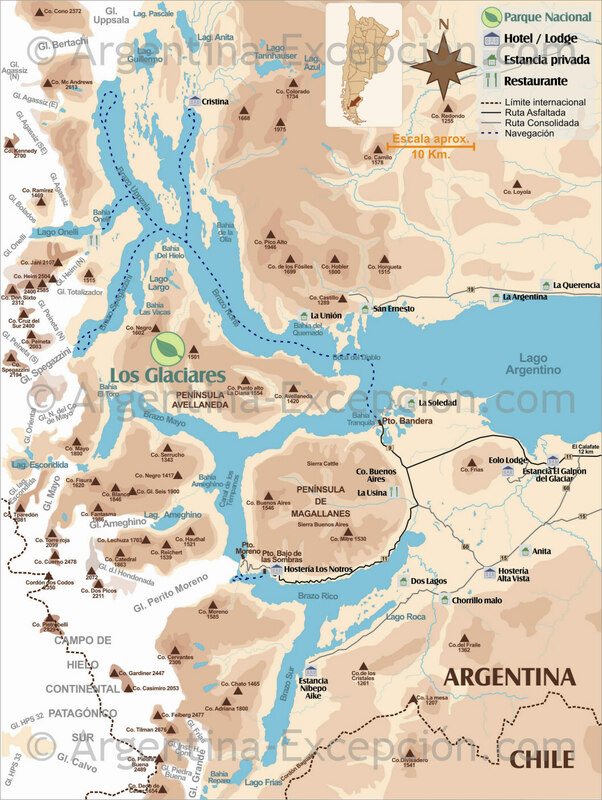 North the Glaciers Park, Lago Viedma spreads over 1,100 km² and is dominated by Mount Fitz Roy standing northwest. 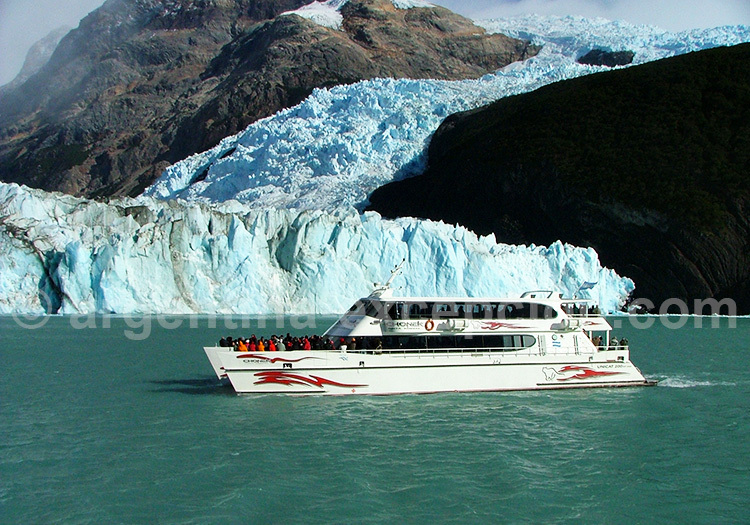 Two boat excursions depart from Helsingfors estancia towards the Viedma Glacier, the biggest after the Upsala: it is about 80 km long and 5 km wide. The Viedma would be significantly receding due to the global warming and may disappear in the following decades according to Greenpeace warning dated March, 2008. The town of El Chaltén, by the Lago Viedma, has experienced a significant growth; however, it doesn’t have the amount of services offered by Calafate yet. 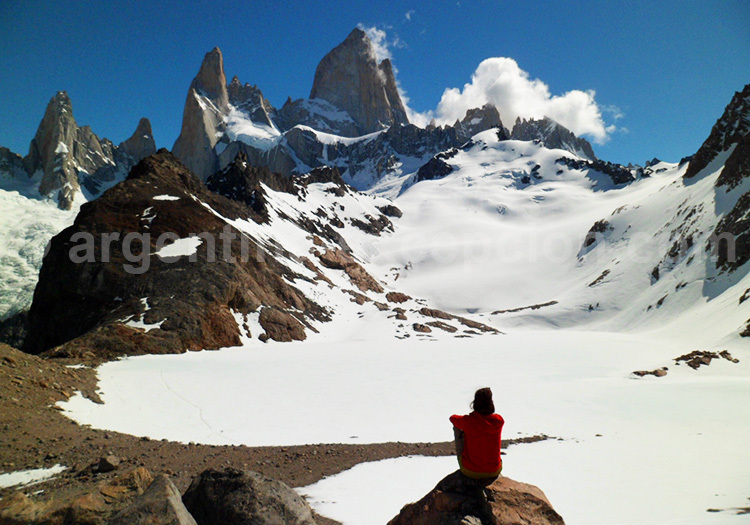 This town is the access point to Mount Fitz Roy and the Cerro Torre, which attract trekking lovers. Among the excursions available are walks or horse-rides down the Valle de Las Vueltas, a Patagonian forest (ñires or lengas, from the beech family) with lakes, falls, estancias, and, if you are lucky enough, you may see some pumas, foxes, guanacos, deers, or condors. 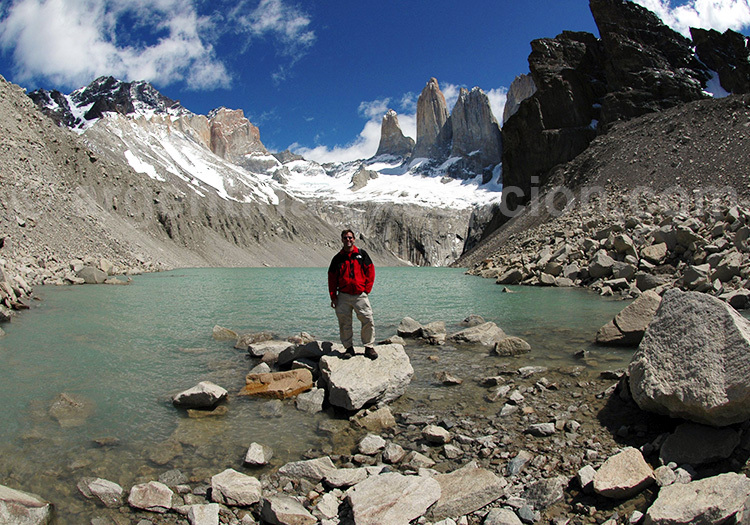 Climbing up Mount Fitz Roy (3,405 m) is especially known as hard and only ventured by expert mountain climbers. Those not so sport-fans may try getting close to one of the most beautiful peaks of the Andean mountain range on foot. The Cerro Torre, is a bit less tall (3,128 m) and almost impossible to climb: it ends up in a granite 800 m wall and its summit is capped by ice. 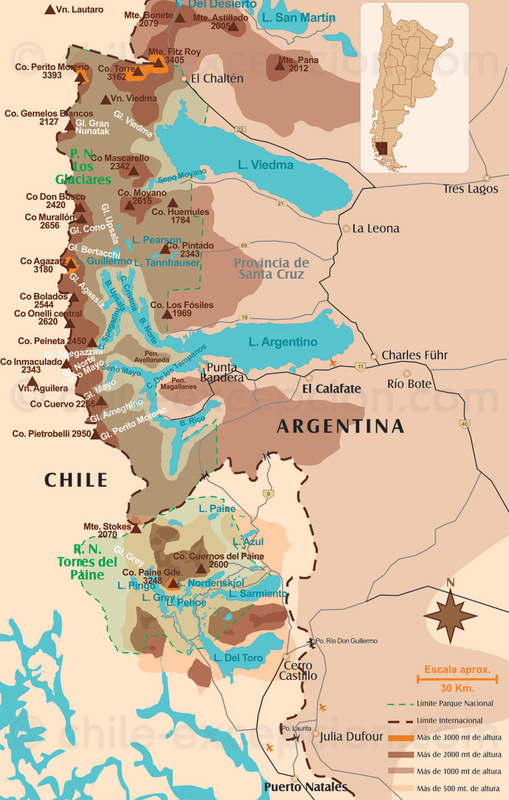 At the bottom of the Cerro Los Hornos and south the Lago Viedma is the petrified forest dating back the formation of the Andes mountain range, millions years ago, when volcano eruptions and ash falls buried the forests that spread over the region. A depression unveiled these tree and dinosaur fossils that can be observed at present. From Calafate, going through the Cerro Castillo crossing point, you may reach Puerto Natales, in Chile, and then the Torres del Paine National Park (115 km away from Puerto Natales). There are several pathways opened in this 181,000 hectare park for one-day excursions or 4 to 8-day circuit spending the night at refuges. This granite mountain is one of the most amazing in South America: its has peaks, falls, glaciers (Francés, Grey, Dickson), forests inhabited by guanacos, ñandúes, flamingos, and many other mammals and birds. 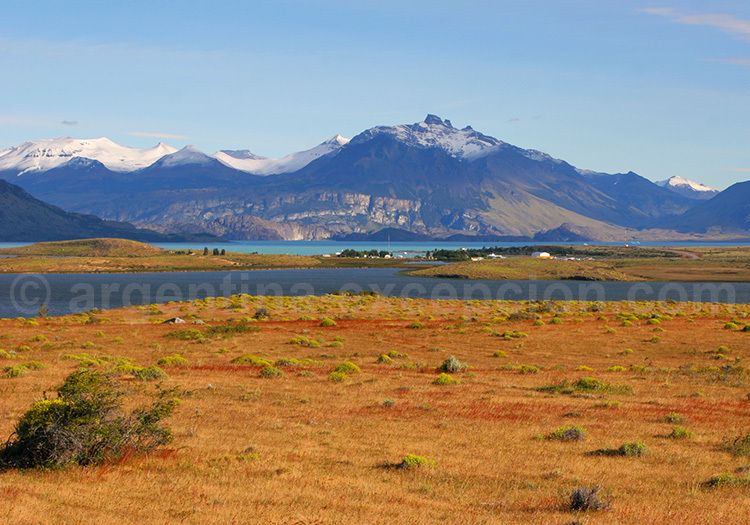 Easily recognizable are the three peaks of the Torres del Paine, the most celebrated of this mountain. The highest summit is 3,050 m tall (the Paine Grande). The park has been declared Biosphere Reserve by Unesco. Gastronomy : what to eat in El Calafate? Patagonian Lamb (cordero patagónico) : “THE” Patagonian specialty is a must. 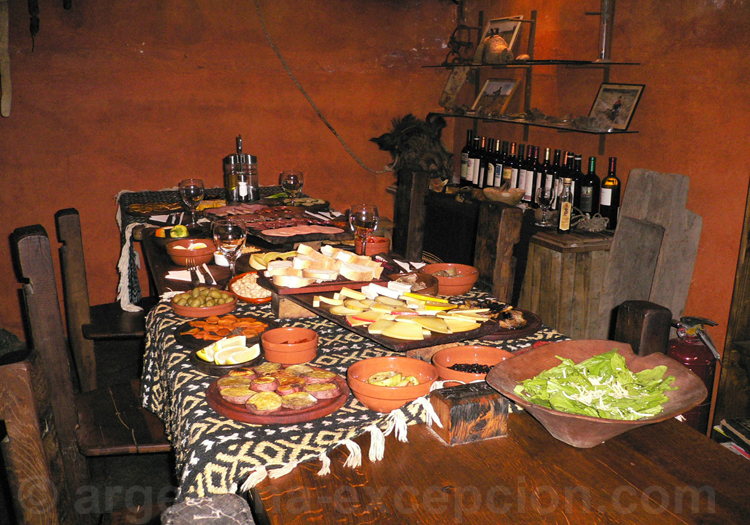 Usually, lamb is prepared on the parrilla (Argentine barbecue), at crossed poles (en cruz), in the oven or with a sauce. 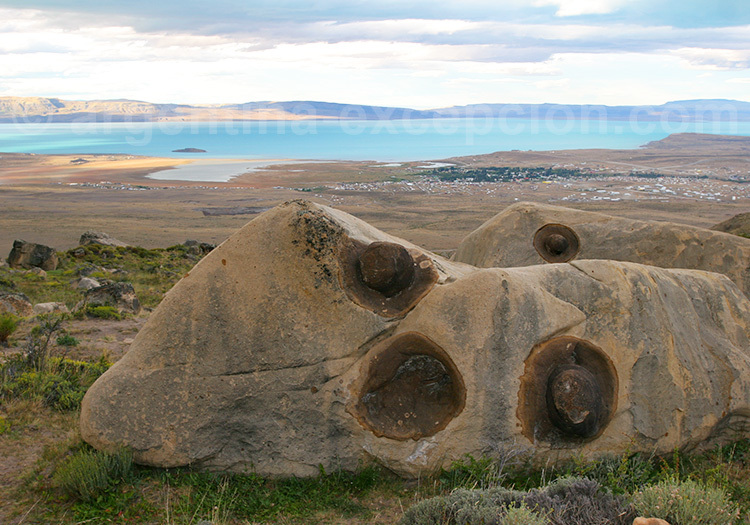 Calafate : El Calafate has been named after the calafate spiny shrub which produces a berry similar to the blueberry. Legend tells that if you venture to try it, you are definitely coming back… Try it as jam or in pies. .
Chocolate : Patagonian specialty, with various non-industrial shops that produce their own chocolate at town. Hotels : where to sleap in El Calafate and El Chaltén? 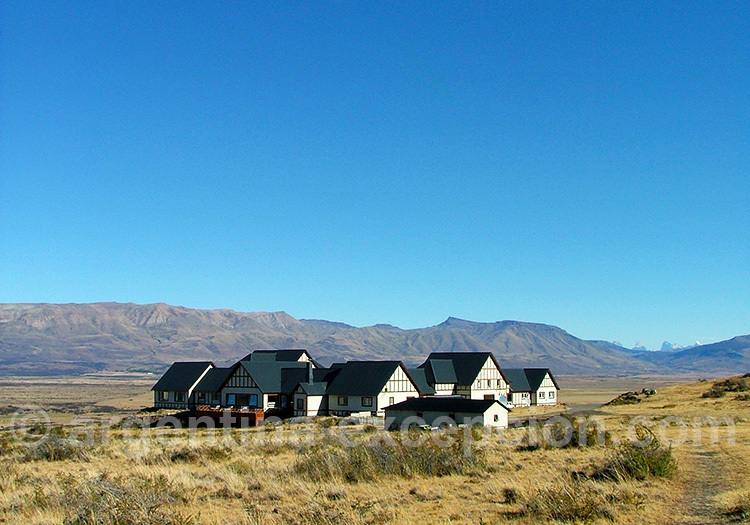 Eolo Lodge, El Calafate : 20 km away from El Calafate, Eolo evokes the spirit of the old Patagonian estancias. It has heated pool, sauna, 360*C view of the place and first-class gastronomy. Design Suites Calafate Hotel : an avant-garde style that respects environment, to appreciate all the majesty of the Patagonian landscapes. Casa Patagónica Los Sauces Hotel : private environment for this charming hotel, located in a park and enspired by estancias. Excellent restaurant. 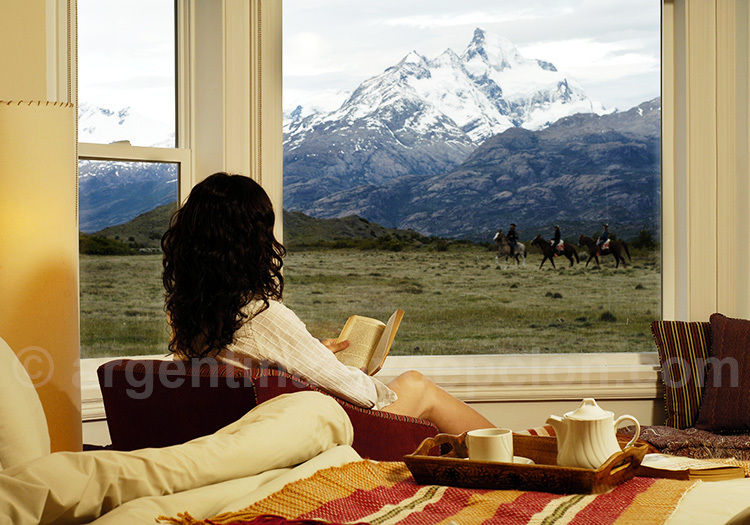 Los Cerros del Chaltén Hotel : near the Viedma Glacier, and in the Argentine capital of trekking, hotel Los Cerros has guestrooms with huge windows to admire the beauty of the mountain views. 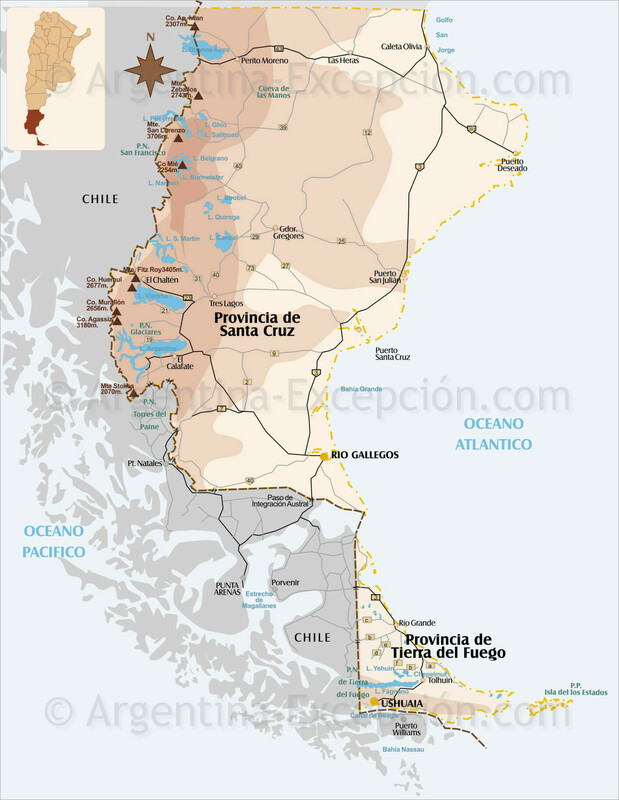 Transportation: how to get to El Calafate? Plane : The “Comandante Amando Tola” international airport of El Calafate, opened in 2000, is located 23 km away from the city. You can get to the place through: Aerolíneas Argentinas, Lade, Lan Argentina Aerovías DAP charter air carrier towards Puerto Natales and Punta Arenas. Direct flights to Buenos Aires, Ushuaia, Trelew (Península Valdés), and San Carlos de Bariloche. Bus : For long distances, a connection will be required at Río Gallegos, at 5 h route distance (320 km). Direct buses to El Chaltén (4 h) and Puerto Natales in Chile (5 h). 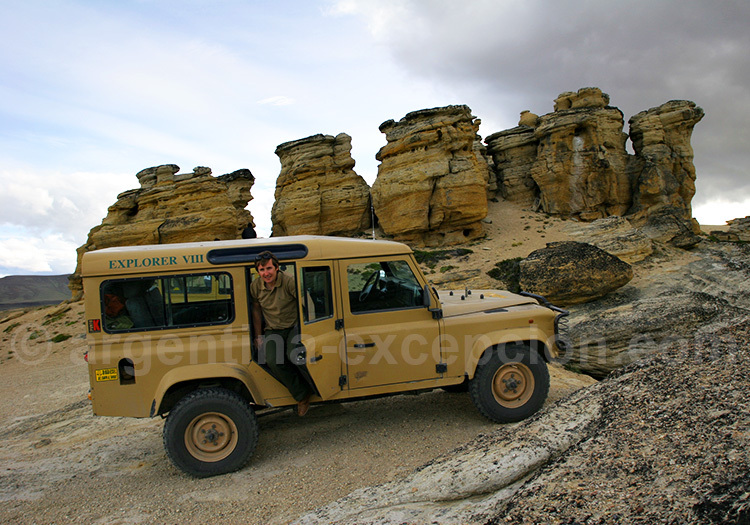 Buenos Aires is 2,800 km away from El Calafate… a total adventure! 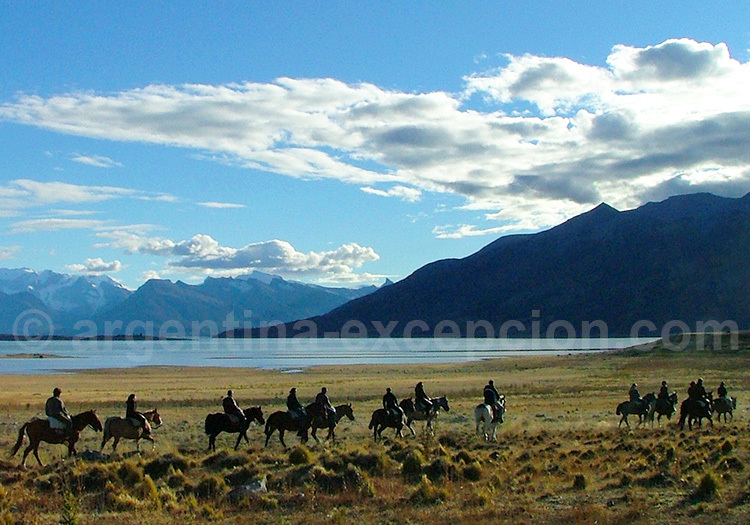 Estancias and gauchos of Southern Patagonia : 114 days at 3 estancias in the region of El Calafate. 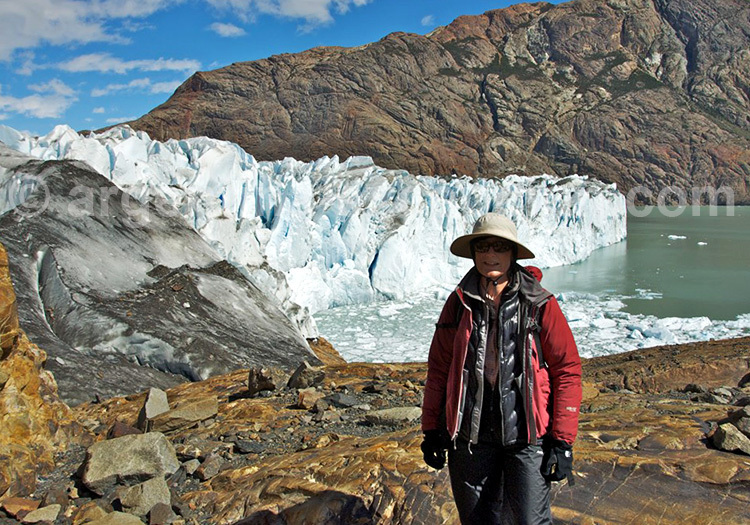 Discovering the glaciers, horse-rides, and life of the gauchos: genuine Patagonia. Trip from the glaciers towards Torres del Paine National Park : 10-day Fly & Drive circuit to see the main spots:Lago Argentino, Glaciar Perito Moreno, El Calafate and Chilean Patagonia. 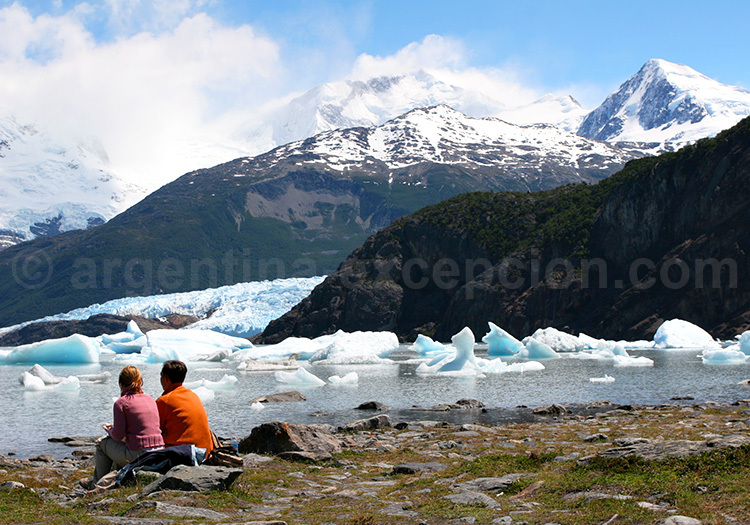 Trip to Tierra del Fuego and the Patagonia of the glaciers : 11-day tour with guide and chauffeur from Bariloche to El Calafate.